Selecting house paint colors to beautify your home. So how do we go about choosing colors you ask? Well let’s look at some of the basics when it comes to picking house paint colors. What house paint colors are going to work for you? I would start with the list above and determine what house colors you can’t change.Things like furniture and accessories have to stay for most people. Here is an example of someone who chose to change their trim to black.This was for an office mind you,but i have seen black work in many homes.Of course black trim is not going to work for most homeowners. Most home owners choose white as their accent trim color. White semi-gloss paint is usually the best choice because it is easy to clean and quite durable and bright white trim always looks great. This is a color swatch which every professional painter carries to help with selecting paint colors. Some paint suppliers will send you a swatch if you go to their site and ask, I get mine free from paint stores. This all depends on where you are.You want to determine what paint suppliers are in your area first. Below is some more help picking colors. It it only my opinion of course, but I don’t care for most of the paints at home depot or any of the bigger hardware stores. You can find way better quality of paint at local paint suppliers.It’s pretty easy to get signed up at most paint stores for a discount also. Also consider buying some nice pictures and mirrors to enhance your paint project. Try to pick something that goes with your existing furniture accent colors. If you have black accents on your living room furniture then pick a picture with a black frame. I find mirrors are always a good choice for any room. Just be aware that if you pick bold dramatic colors,you may find yourself restless and uneasy in that room. They can look great at first, but they can have an adverse reactions to some people. I usually suggest only painting one wall with a dramatic color.The picture above is too dramatic and personally I would have went with more black accents.You can see how well the black stands out. Most people want more calming softer tones.They are much easier to blend with existing furniture. Don’t match the paint to the main color of your furniture. Instead try to stay in the same color range like this living room.the sofa and main furniture is dark brown.The taupe color matches the natural wood which is a trim color.The black picture frames match the spindles and cushions which are great looks for house paint colors.. 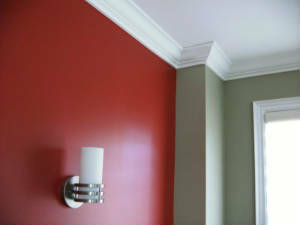 Here is another good example of picking house paint colors to match the trim pieces. The trim which is always the less pronounced color matches the headboard and pillows. These paint colors look great in this room with the white accents. Now let us take a look at some exterior house paint colors. Sometimes just painting the white trim can make a huge difference in your curb appeal.If your home is like this one which has lots of trim,consider painting the trim first to make your exterior painting go easier. Then of course if your exterior siding is flaking and cracking it’s time to paint your home. Your home is an investment and needs to be looked after.Quality paints and primers are always a good choice for exteriors. Don’t ever neglect to take care of your home’s exterior. Finding the right house paint colors can be tough.Do some research in home improvement magazines.Consider painting your front door an accent color.Drive through your neighborhood and look at the other house paint colors to get some ideas. Another great idea is asking a professional painter for some house paint colors interior ideas.The choices are endless when it comes to house paint colors. I have even seen several homes with black trim which can look awesome.I personally love red front doors for one house paint color. I would have to say red is one of my all time favorite house paint colors. I am sure with a little help you will find the absolute perfect house paint colors.If you need more help ask a professional for help with choosing paint colors. I have some more images for house paint colors on pinterest. There are several great house painting pictures on pinterest to help pick the best colors for your home. Some people have found the online house paint simulators to be help as well.I prefer to use images for house painting ideas.Here is some popular exterior house paint colors. I hope some of these pictures help you decide on house painting colors. I even share links on twitter for house paint colors interior ideas. Twitter can be great for just sharing images of paint colors. I found some great pictures on pinterest and youtube of all places.I also found this cool site with some amazing new house paint colors. It is all about the accent colors to really make a freshly painted room look great. Selecting the best house paint color combinations can be fairly simple. In a master bedroom, pick a color that matches the bedspread for example. I find long window drapes make an excellent choice for accent colors. Finding paint color advice.Ask your friends and family for advice on paint colors.I also tell people to ask the professional painters what colors they would choose. Here is a great little video I found on exterior house paint colors. Choosing the right accent colors when painting your interior can be easy. Something as simple as matching the curtains to your accent color can be amazing. This photo shows how dramatic the accent color can make this room color come alive. When selecting your new house paint colors it is always safe to choose soft warm neutral colors. I mean sure beige colors can be boring but you can accent any color to make it stand out. Painting all your trim bright white semi gloss always works well with neutral colors. Most paint stores carry color swatch books for contractors. It doesn’t hurt to ask about using one for selecting your colors. Rather than deal with small samples which can be a real headache, I find using a book of colors much easier. Some people have a difficult time when it comes to choosing house painting renovations. It is always a good idea to get several opinions on your home renovations. Something as simple as picking house paint colors can be tough for some, which is why I decided to make a site to help home owners make better decisions when renovating. It is always important to choose the proper lighting when selecting your paint colors.Some lights make some paint colors look darker.The best way to be sure of the color you select is first doing a small paint sample.Sometimes simply changing the curtains to allow more natural light in makes all the difference when coming up with new interior design ideas. If you are having difficulty finding the right house colors consider looking at some sites like pinterest. I have looked at countless sites for ideas and found some of the best house paint color photos on places like pinterest. Another great idea for finding awesome paint color photos is simply searching google for house color photos only. Finding the right house paint color scheme for your home can be challenging. Some online paint simulators are available,I never had much luck using them.Looking at pictures of completed painted house can make the color selection easier.I use pinterest for looking up some great house painting color schemes. Finding the latest and greatest house painting trends are easy to find. I find sites like pinterest are great for finding the latest house painting trends. Pinterest seems to have the most current pictures of house painting trends. I find that some other sites have old pictures that are just not that current if your are looking for the latest trends in house painting which should give you some new house paint color tips. When it comes to house painting, home reno ideas are hard to find for some homeowners. Painting is always been one of the easiest and least expensive home renos. Adding little things like shutters can made a huge difference to the exterior when renovating. I always suggest looking around sites like pinterest for new home reno ideas. I have found most of the best pictures on pinterest when it comes to finding the right color tint. There are thousands of great pictures online to be found. This makes selecting the right tint easier for some homeowners. Let’s face it finding the perfect color tint when painting can be tough. Most ceilings have some sort of texture. Repairing ceiling texture can be tricky. Most home hardware stores carry small cans of texture for repairing small patches in ceiling texture. Spraying texture on a ceiling can be messy and needs to be prepped. There are some good videos on YouTube for repairing small texture jobs. Painting has always been one of the most simple renovation idea for any home. Finding the right color scheme can be the hard part for some home owners. I find it is always best to ask your local experts for advice. Most professionals do not mind giving advice for free on how to best renovate your home. Finding the professional renovation advice can be difficult for some homeowners. With the sharing of information online increasing everyday in can be hard to find the right advice. I have used several places like YouTube for professional renovation advice. I use YouTube for all kinds of great advice on several thing from fixing computers to installing floor tiles. Most professional renovating companies don’t mind giving free advice on paint colors. I have found that most of the big paint stores have their own paint color simulator. The only way to generally use them is to actually go to their site. I have been looking for a good free paint simulator program to share one here. For now I will add a link to one on hgtv. The paint simulators should only be used as a guide because the actual colors can change from store to store. There are common color choices for exteriors. Finding a new and popular exterior color can be hard to envision for some. I like to look at the accent color choices as well when deciding on the main color. There is some stores that offer very large samples of paint colors,they are usually 2 feet by 2 feet square samples. I prefer buying the little sample colors for testing which cost less than $5 each. The best way to test out a paint colors for your final test is with small samples. Most of the bigger hardware stores offer miniature paint samples usually for under $4 each. I have found those small paint samples of paint are just right for painting several 3 foot square samples. Sometimes I went through 10 paint samples before finally deciding on colors. This paint testing method has saved me hundreds on cost over the years, not to mention being eco-friendly. I have had my share of problems finding the right paint color combinations for various houses i have painted. I try to avoid selecting paint color combinations. Some people have a real art for picking the right color combinations. I suggest if you are having trouble picking paint colors that work well together find someone who can. I like to use pictures for selecting my paint color combinations. Places like hgtv are great for finding amazing paint combinations. Online shopping has become quite popular and safe over the years. I have found some of the best deals on just about anything online. When it comes to buying paint or supplies, I do believe that online shopping will only get better for the average homeowner. It still pays to know where to shop online for any painting supplies. Soft colors are generally safe for any room. Using just about any real light tint is considered safe on places like rentals. I have painted hundreds of rentals and most owners choose light beige colors.Light blue is another common color for rentals. The trim is usually done with semi-gloss white and the ceilings are generally flat white. Soft colors are good for rentals, but they are quite plain and boring as well. I like to have at least one dark color for walls in any home.Dark colors always add depth when done properly. Painting all walls in one room a dark color is never a good choice,the key is to add accent colors. Most rooms look best if they have an accent wall color. When painting a big room, choosing a dark color for one wall makes everything look better. The best way to brighten up your kitchen is to paint it. Some of the new bright colors can look great in the kitchen. I have even seen some nice blends of white and yellow paints. Color choice is key when decorating and room. i have always liked certain yellow tints for accent walls as well. Some colorful house painting ideas. Want to paint it yourself? I have created some helpful ideas on leaning to paint.Save money on painting your own house.Take some time to learn how to properly paint your home. Please take the time to share my free house painting advice by clicking on any social sharing icons. The cost to paint a house diy can still be expensive.When you add up all the tools needed, house painting can be more expensive than you think. Painting the interior of your home can be fun. Looking for a free online house painting calculator? Here is a free online painting calculator to help with your house painting needs. Selecting the perfect color scheme for your home. I have always found that pictures can make selecting the right color scheme easy.I found Pinterest to be a great site for house painting picture color schemes. To paint an average room usually cost between $200 to $300. More house painting prices can be found on the paint job prices here. I also share a great video on how to paint interior walls. Trying to save money on house painting can be tricky. For example:buying cheap paint is not recommended, cheap paint will not last and usually requires more coats to cover properly. It is definitely worth it to spend a little more on quality supplies when calculating how much to paint a house cost. Wallpaper can add great accent to any wall.interior painting can look awesome with a touch of wallpaper. I recommend only using wallpaper on one wall. Take the best steps when learning how to paint a house interior. I have also included pages on how much to paint a house yourself. For the homeowner who would like to save painting cost by painting it yourself. Learn about each and every cost in painting your home.Inform yourself about choosing the contractor.Find out what are all the actual cost in painting your interior and exterior.Making the best choice for you and your family. There are several ways to find a good reputable painters. Simply asking friends and neighbor’s can be a great place to start. When getting a quote from a professional painter ask lots of questions about the various cost. You have the right to know everything. Being a professional painter for more than 20 years, I decided to share some helpful information about house painting. I have been asked about the cost to paint a house several times over the years. I then decided to create a site about house painting to help homeowners find fair prices when hiring a professional painter. Sometimes even adding small color coordinated wall art can make your walls look amazing after painting. Is it time for to give your house a coat of paint? There are several great options when painting your house. I will show easy ways to calculate how much to paint a house cost. How much does paint cost?I have included a page with all the information on actual paint cost. I have also included some great bathroom painting ideas here . More house painting quotes and cost.Average house painting prices in your area can be hard to find. How much to paint a 1500 square foot house? Painting a 1500 square foot home. Hiring a licensed contractor painter to paint an average interior can cost $2,500. When looking for house painting cost get 4 painting quotes.The reason I suggest getting 4 house painting quotes is for safety.This way you can be sure you get a good honest painting quote. Looking for some tips on finding house painting prices? Then look at some of my pages on how much to paint a house cost. Here you will find all kinds on house painting prices and guidelines for reputable house painting quotes. Would you like help with how to paint your house yourself?Then check out my free painting help pages. Interior house painting cost will depend on the size of the room.Check out my house painting prices page for how much to paint a house cost. Here are some wallpaper ideas and tips for your house.This wall paper looks great with this bedroom paint color. Some people need help with the cost to paint a house yourself.I have added a separate page just for painting a house yourself.Take a look at my other pages for some helpful do it yourself painting tips. The average cost to paint a room is usually around $200.This is only an average cost to have a room painter by a professional. Interior painting rates usually start around $200 per room. More information can be found on my page, paint job prices. This is the easy way to determine things like : how much does paint cost? How to prep your house for painting. Painting exterior siding properly that has been neglected for years can be expensive, but looks simply amazing after. Well that depends on you. I personally hate the look of vinyl siding. To me it just looks cheap compared to natural wood siding. Here is some free help with house painting.From house paint colors to diy tips and tricks.Let's face it, painting your house can be a huge job. If you are looking for help with how to paint with a brush or roller here is some helpful information. I also have some links to videos on how to paint here. I have included a house painters price guide on my other page called paint job prices. Whether you're hiring a professional painters or D.I.Y painting always choose quality paint supplies and tools. Cut your cost by shopping around at paint stores, hardware stores, and online suppliers. Always insist on hiring professional, trusted, qualified contractors for any home renovation. Check references, get 3 detailed estimates, and never pay 100% until the job is fully completed. Save money and paint it yourself. What some help with learning how to paint, here is some helpful painting tips and links for making the job easy. When it comes to replacing drywall, the painting contract can double in price when calculating how much it cost to paint a house. Copyright © 2019 How much to paint a house. Powered by WordPress. Theme: Spacious by ThemeGrill.